It would be natural to conclude that Gökhan Mutlu is ambitious. The former valedictorian of the top public high school in Turkey went to one of the country’s best medical schools and graduated sixth in his class; two years ago, at age 45, he was selected to lead the storied program in pulmonary and critical care medicine at the University of Chicago. Dr. Mutlu’s research career began with Phil Factor, DO, at Northwestern University, where he studied the role of ß2 adrenergic receptors in the clearance of pulmonary edema in the laboratory. He has furthered understanding of the causes and resolution of acute respiratory distress syndrome by studying the role leptin, glucose metabolism, mitochondrial reactive oxygen species, and other factors play in the critical illness. His experience with mouse models led to an ongoing collaboration with Scott Budinger, MD, a colleague at Northwestern University who has since become pulmonary division chief. The two have looked at the effect of particulate matter on lung inflammation and cardiovascular disease with major grants from the National Institutes of Health. Dr. Mutlu has focused on how inflammation induced by exposure to particulate matter air pollution in the lung can affect both the liver and the sympathetic nervous system to increase the risk of heart attacks and strokes. Dr. Budinger says his research collaborator is also adept at inspiring trainees in the lab by finding out what their research ideas and career aspirations are. Dr. Mutlu might never have left Turkey were it not for his wife, Ece, who was a classmate at Istanbul University’s medical school. She studied at Robert College, an American college preparatory school and wanted to return to the U.S. after medical school. She is now a faculty member in gastroenterology at Rush University Medical Center in Chicago. 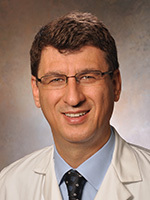 After two years of a medical residency in Turkey, Dr. Mutlu began his residency at the University of Illinois at Chicago/Michael Reese Hospital. Like many ATS members, his work in the ICU convinced him to pursue fellowship training in pulmonary and critical care medicine. “The way patients responded to therapy in the ICU fascinated me and got me interested in physiology and pathophysiology,” he says. He also completed a fellowship in sleep medicine at the university. Jacob (Iasha) Sznajder, MD, met Dr. Mutlu during his residency at Michael Reese Hospital. Later, when Dr. Sznajder was division chief at Northwestern University, he recruited Dr. Mutlu to the university’s faculty. The two have been research collaborators since then, and when Dr. Sznajder served as editor of the American Journal of Respiratory and Critical Care Medicine, Dr. Mutlu was an associate editor. Dr. Mutlu is currently serving as an associate editor of the American Journal of Respiratory Cell and Molecular Biology. Dr. Mutlu says that without the help and support of Drs. Sznajder, Budinger, and Factor he “couldn’t have achieved what I have.” Though his career has been based in the U.S. for many years, he returns to Turkey periodically to give lectures for the Turkish Thoracic Society. In addition to reading as much fiction and nonfiction as his schedule allows, Dr. Mutlu relaxes by making models and painting watercolors. He played soccer growing up, is still an avid fan, and enjoys watching his 14-year-old son Emre’s soccer games.